Last week I fulfilled a life time ambition to canoe across Scotland, from West to East coast along the Great Glen Way. As you can imagine, I was intrigued to see if I could find real cider in Scotland along the way! First stop was Glasgow, and the Bon Accord bar – no real cider here, but what a treat for ale fans – 10 real ales from around the UK, and a very limited edition batch of 120 bottles of Speyside whisky made by the pub, minus one now. Then after 60 miles of paddling, we arrived on shore at Urquart Castle and walked to the nearest village of Drumadrochit. Where we discovered the delightful Benleva Hotel where we enjoyed Weston’s 1st Quality cider. This far north and it didn’t taste bad at all! Then it was a short hop back to civilisation to Inverness, where we were in for another treat. The Blackfriar’s pub has been nominated as cider pub of the year for 2009 in the Highlands and Western Isles. We enjoyed two Weston’s cider’s on draft – old rosie and 1st quality. If you are visiting Scotland soon, or if you are lucky enough to live there and are unsure where to find a real pint in a decent pub, then it’s worth checking out this years pubs of the year in Scotland, you may be able to find some real treats and experience the Scottish hospitality like we did! 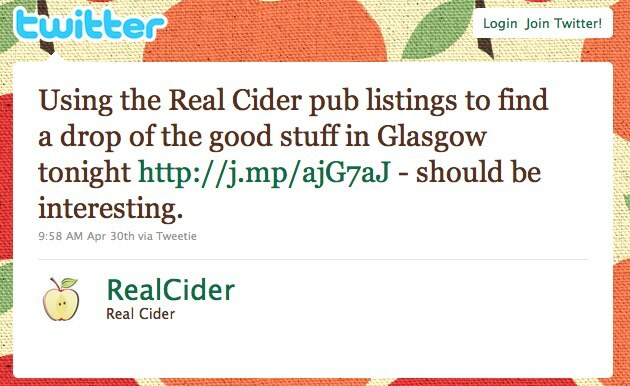 View our listing for real cider pubs in Scotland on the real cider web site. Do you know of any real cider pubs in Scotland that we should mention? Any special places that you have found the special stuff. Let us know in by commenting below.